Topological insulator (TI) is new quantum state of matter that has attracted a lot of interests. TI possesses a twisted bulk electronic structure that can be characterized by a non-trivial topological invariant (Z2 = 1) according to the quantum theory of topological phases. 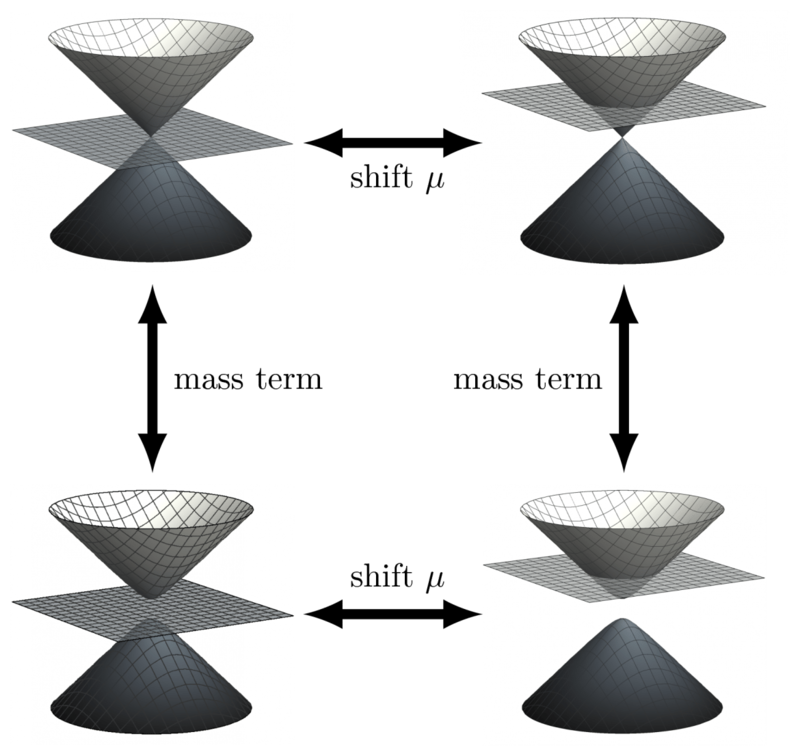 This twisted band structure will lead to, on TI’s surface or edge topologically, linearly dispersed and mutually crossing metallic energy bands, called Dirac cones, that are protected by time reversal symmetry. These Dirac cones have interesting physical properties such as helical spin texture and lead to fundamental phenomenon such quantum spin Hall effect. TI is found experimentally first in a traditional semiconductor system HgTe/CdTe quantum well. The introduction of band topology in technologically critical semiconductors has significantly enriched the physics of semiconductor physics, on the other hand, it opens the way to realize many intriguing quasi-particles that were predicted decades or centuries ago such as Majorana fermion, furthermore, it lightens the new era of semiconductor electronics that can incorporate the quantum quasi-particles in everyday life. However, one of the disadvantageous facts about TIs is that they are very rare. Not surprisingly, whereas theorists predict lots of TIs in a range of assumed crystal structures, these are rarely realized experimentally. It is currently hard to find a viable stable TI that can be used in electronic devices, let alone finding various candidates to form suitable interfaces with different semiconductors. It is critical to find out the reason behind the rareness of TIs and the route to go beyond. In a recent paper, we qualitatively studied the relationship between stability and topological properties, revealing their general conflicting tendency. The twisted electronic structure in TI is associated with a band inversion, or an inverted order of the occupied valence and unoccupied conduction bands at time-reversal invariant wave vectors in the Brillouin zone (BZ). This depopulation of bonding valence band states and the occupation of anti-bonding conduction band states could be contraindicated to crystal stability and can drive structural deformations that alter the crystal symmetry and undo the band inversion if carried out throughout a significant portion of BZ and left unscreened as in strongly ionic systems. We demonstrate this idea in a group of perovskite oxide TIs by identifying their functionality gene, a local electronic motif that enables their topological properties. The distortion of this functionality gene during the structural deformation that gradually removes the band inversion was traced, revealing the interplay between band topology and stability. During the study, we find a narrow coexistence window for TI and stability. Not surprisingly, the currently realized TIs reside in this window whose narrowness suggests the rareness of TIs. The studied oxide TIs reside outside of this window and undergo structural distortions as found in experiments. By studying the effect of external constraints on the TI functionality gene, we find that the above coexistence window can be significantly extended under moderate pressure. The new coexistence window now encompasses different types of TIs including many of the previously predicted TIs and the oxide TIs discussed here. Indeed, the oxide TIs are stable under moderate pressure according to our calculations. This study, The Enabling Electronic Motif for Topological Insulation in ABO3 Perovskites was recently published in the journal Advanced Functional Materials.